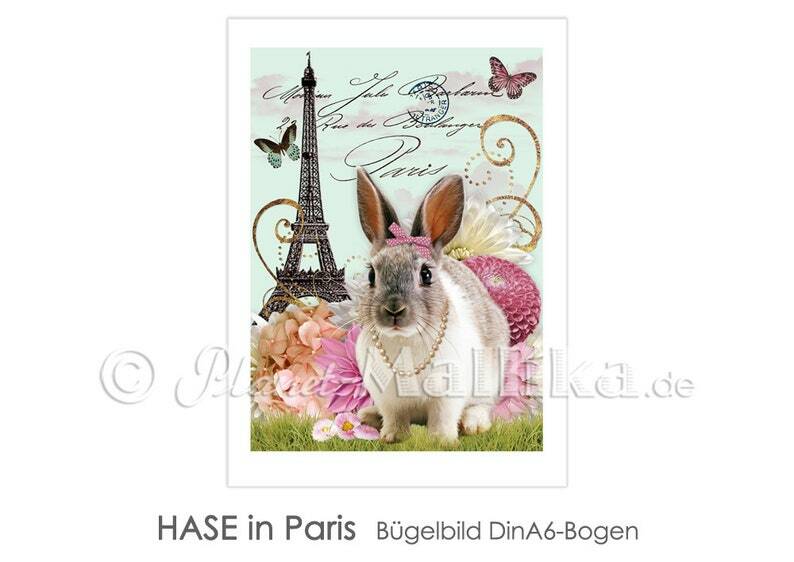 Bunny in Paris-cute bunny with delicate flowers, butterflies and Eiffel Tower. Delivery 3-5 days from payment. Our ironing pictures can also be printed in other sizes and with individual labels (numbers and texts) or other decorations such as frames, flowers, and more. The background and, if necessary, the font can be changed in color. Please adjust all wishes before a purchase, as-depending on the expenses-possibly higher costs can arise! Our ironing pictures can be supplied for white or colourful fabrics. Please refer to the different properties in our shop FAQ and check which ironing foil is suitable! Attention: If the purchase does not leave anything else, the delivery of the ironing image is done on foil for white textiles. The ironing frames are suitable for cotton and cotton polyester fabrics, canvas and linen. The fabrics should always be pre-washed. The textiles decorated with an ironing frame are washable to 30 degrees. For the ironing pictures There is a detailed instructions for use and care as well as a few small ironing pictures for testing. The ironing pictures are also available as photo printing-e.g. as a poster or postcard-in different versions.